Often when an individual thinks of influential characters in kendo, more likely than not, that individual will think of Japanese kenshi like Mochida Moriji or Takano Sasaburo, or even present day heroes like Eiga or Miyazaki (rightfully so as these people have left a tremendous mark). However, few would think of an American named Dr Gordon Warner. Little information is readily available about Dr Warner and therefore his contributions go unnoticed for the most part. Dr Warner was a pioneer and is largely responsible for bridging the western world to Japanese kendo. In the following post I want to share what I discovered about Dr Warner and encourage those with personal knowledge to contribute below (and please correct any mistakes I may have made!). As a young boy growing up in Southern California Dr Gordon Warner enjoyed watching chambara movies with his nisei friends, which at that time was very rare due to the absence of cultural understanding. Dr Warner often believed the people in the community thought he may have wandered into the theaters by mistake. It was this early exposure to Japanese culture that sparked his interest in Japanese history and eventually budo. Dr Warner, a social studies major at the University of Southern California, was a large athletic man. Standing at 6’4″Dr Warner was on the varsity swim team. During this time he also decided to pursue judo and kendo at a local dojo. After graduating in June 1936, Dr Warner entered the United States Marine Corps as a 2nd lieutenant. It was during his time in basic training that Dr Warner met two officers Colonel Biddle (at the time a renowned fencer and foremost hand-to-hand combat instructor) and Captain Puller, who both encouraged him to continue studying budo, noting that kendoist were adept at parrying attacks during bayonet drills. In 1937 Dr Warner returned to Los Angeles and continued his kendo training, this time under Mori Torao, who at the time was a business major at USC. Mori Torao and Dr Warner grew very close. Mori-sensei was impressed by Dr Warner’s physical ability and devotion to the intellectual study of the art. Mori-sensei gave Dr Warner an invitation to his home dojo in Japan, with which he set sail, landing in Yokohama in September 1937. He presented the letter of invitation to Noma Seiji, founder of Kodansha ltd and the famed Noma Dojo. Under the direct tutelage of legendary men like Mochida Moriji and Masuda Shinsuke, Dr Warner received his shodan from the Dai Nippon Butokuden after two years of training at Noma Dojo. He also began to studying iaido during this time in Japan. Dr Warner returned to the United Stated in 1939, this time relocating to Hawaii breifly, where he continued his kendo training while working as a teacher. As a parting gift he was given a sword that was used in the battle of Sekigahara. That treasure today has been passed on to his children who also practice both kendo and iaido. With America entering a long and brutal war in both Europe and the Pacific, Dr Warner received orders to report to the USMC school in Virginia, where he became a hand-to-hand combat instructor much like his friend Colonel Biddle. As the war escalated, Dr Warner was swept away to the Pacific theater. Dr Warner took part in the Bougainville campaign (Nov. 1st, 1943), being the first to raise the American flag on the island. Five days later after the initial landing, Dr Warner led an attack against a large force with a dug in position. Beginning at 6 AM the battle raged all day long, with Dr Warner’s company eventually over-running the Japanese opposition. Dr Warner used his Japanese language skills to help win the fight by confusing the enemy, by yelling false orders to those close enough to hear him. Toward the end of the battle, Dr Warner had taken command of a tank and led it into a clearing, where it came under heavy fire from two Japanese machine gun nests. The tank took many hits; some of these rounds penetrated the tank’s armor and hit Dr Warner in the left leg, shattering the bone. Dr Warner was awarded the Navy Cross for taking out the machine gun nests and he was recommended for the Medal of Honor for his actions that day. Due to the serious injury he sustained, Dr Warner lost his left leg, amputated just below the hip (leaving only approximately 6 inches of his femur remaining), and subsequently spent a long time recovering in the hospital. Despite of all of this Dr Warner remained in high spirits, shrugging it off as “merely a casualty of war” and “incidental”. All the while he attended classes to eventually receive his Master of Arts from USC in 1944. After the war he chose a career as an educator at the University of California, Berkeley, and began studying for his doctorate. He no longer practiced kendo formally because of the loss of his leg but continued to train on his own with a bokuto. Later Mori Torao would convince Dr Warner to begin training again at a dojo. The teacher and student spent time together carefully going over kihon again, until Dr Warner was able fight once more. He and fellow veteran and scholar Benjamin Hazard organized a kendo club at UC Berkeley, with full support from the university department of physical education. This club still exists today. In 1954, he received his PhD and took a teaching position at Long Beach State College in Southern California. Two years later he would receive 3-dan from the AJKF. Around this time, Sasamori Junzo requested that Dr Warner come to Japan to take part in a four week US-Japan goodwill tournament that would be held in Tokyo, Yokohama, Kyoto, and Osaka. Dr Warner hikiwake-ed twice, lost once, and won his final match in Osaka. One year later (1957) Sasamori Junzo would tour the US with a 13 man an all Japan university team, performing exhibition matches, with Dr Warner’s Long Beach State College being the site of the final match. Dr Warner would continue to visit Japan several times over the years. In 1959 he would meet and train with Higashiyama Kennosuke (Kendo instructor to the Wakayama prefecture police), who had lost his right leg above the ankle. That year he would continue to train all over Japan, visiting more than 20 different dojo, finalizing his trip with the Imperial Guards kendo training. He was later rewarded 5-dan, making him the highest ranked non-Japanese at the time. In 1961 Dr Warner took a year long sabbatical to return to Asia, traveling to various dojo again and to finish the first draft of his book “This is Kendo: The Art of Japanese Fencing” with his friend Sasamori Junzo. “This is Kendo”, which was eventually published in 1964, would be the first book of its kind in English, and remain one of the few English language resources for many years to come. He would later on publish “Japanese Swordsmanship: Technique and Practice” with Donn F. Draeger, along with many other books on Japanese culture and history. He was also the first editor of Black Belt magazine and wrote numerous articles. Before airplane travel, at a time when overseas communication was limited to handwritten letters, in the face of limited cross culture understanding, Dr Gordon Warner achieved what only a handful are able to do today with modern conveniences and readily available resources. He traveled to and practiced at legendary dojos, some of which are no longer here today, with many famous kenshi, and established life long relationships with the most important men in kendo history. We as non-Japanese kenshi are directly influenced by his passion for kendo and should give thanks for the cultural bridges he established. So you want to research traditional ryuha? Nice piece here. I always found it odd that he isn’t more well known in the West as in my own personal travels to various dojo through Japan, when the subject of the Western practitioners comes up, Dr. Warner is by far the most common name that comes up among the older generation of Japanese sensei I talk to, with Draeger usually following a few minutes later if the conversation continues. Funny you should mention that Rennis, because the first time I actually heard of him was from one of my sensei. After practice we were sat around chatting and somehow the topic of people with physical disabilities who do kendo came up. We talked about a couple of one armed jodan players, I brought up Henry Smalls (the fellow with no legs from Hawaii), and one of the sensei (he actually fairly young, still 38 or 39 so even younger back then) went on about Dr Warner. I went home and searched his name and it was one of those forehead slapping moments. ‘Duh, the guy who wrote “This is Kendo”!’ I thought. I am still not able to find much information on him. The little bit of information I was able to gather and post here is from “This is Kendo”, USMC, back issues of Black Belt (the One Legged Swordsman article in particular, however a lot of the facts from that article conflicted with other sources), and an old radio interview titled “Kendo: My Life” from 1980 or 81. Let me give thanks now to Cornelius from KWF for being so kind and sending me a copy of the interview. Many Thanks! When I first met the man who would end up becoming my sensei in Hoki-ryu back in 1998 the first person he mentioned was “the guy with one leg” (took him a few minutes to recall his name), then Draeger came up, followed by Meik Skoss. Ever since, every where I go it is pretty much the same order, unless it is a jo group, in which Draeger will usually come up first. A couple people I know are in contact with Warner so I’ll see if they have any additional info that could be added (I seem to recall that he may to Mugai-ryu, but I could be wrong on that). Cheers Rennis. I couldn’t find any information on his iaido career and don’t have a copy of that book he coauthored with Draeger. I have some pictures which I skimmed from the Internet. I forgot where. But on it you can see USMC fellows giving Kendo a try. I wish I could remember where I downloaded them. I just uploaded them in the media section. Let me know whether it’s any use because the format has changed during the upload. Very nice essay about the author of the book which helped me in my modest Kendo career. Wow – really inspiring. Makes one’s own challenges pale in comparison. Kudos for the article Leiv. Thanks for this article. We all should be thankful to this man and his in dept study of budo. Is good to know some of the roots of Kendo outside Japan. Of my three years on Okinawa, my most memorable times are this encounter with Dr Warner and my time practicing under Master Kise. Very nice article on a great Artist and Author..
Mike thanks for the great story!!! I am deeply saddened to hear of your loss. Hopefully this article can – in some small part – keep his memory alive and serve as inspiration to further generations of kenshi. Thank you for sharing Ion. I am very sorry for your loss. An amazing story. Many condolences to his family. I mourn the passing of Warner Sensei. He truly altered the course of my life. I met him in 1982 on Camp Butler. He told me to come and practice Iaido with him. I practiced Mugai Ryu under him. Later, he introduced me to other teachers. He was a tough uncompromising teacher who could also be the kindest, most charming person you could meet. I also took college courses with him at the University of Maryland on Okinawa. He was truly a special professor. His approach to teaching was dynamic. When I would visit his house on Friday nights we would sit in his genkan. Mrs Warner would have two large glasses of either orange or grapefruit juice out and Dr. Warner would always start out asking me questions, then it was my turn to ask. If I did not prepare for our conversations he would end the visit and tell me come back the next week. I learned to be organized and thorough in my research from him. When I got divorced he had me come over to his house and gave me detailed instructions on how to take care of my two little boys. Both Mr and Mrs Warner are the most earnest people I’ve met. On their occasional visits to Tokyo during the 1990’s he and the lovely Mrs Warner (It always made me uncomfortable just calling her Mrs as she is a Doctor also) would meet me at the Sanno Hotel, usually for brunch. I remember delighting him once by giving him a pre-war Kendo manual that I picked up, because inside were diagrams and instruction for grappling and foot sweeps. He also let me use his name as an introduction to Yonehara Sensei, Soke of Sekiguchi Ryu. Dr Warner was well remembered in Kumamoto. Dr Warner was also happy to recount his movie life with me on occasion. And I remember how sad he was at the passing of his friend, Mifune Toshiro. Now I sit here in cold Indiana, remembering my teacher. I saw him last May and we talked like just like before, the three of us. Mrs Warner, Dr Warner and I sitting at their dinning table. There is so much I would still like to ask him, so much yet to learn. Gordon Warners daughter has posted a video her fathers burial held at Arlington National Cemetery, 25 May 2010 on youtube. Hi I really like your article. I am the grand-daughter of Gordon Warner. My father William Gregory Warner now deceased was Gordon’s son. My father spent much time trying to get in contact with his father Gordon to have him meet my brother Erik and I.
I really wish I could have met him. I have many kendo pictures of him from the military and some of his bars from his jacket which are all from world war 2. Great article. I do have a couple corrections though. Dr. Warner did not “set sail” to Japan. He flew on a TWA clipper. You know, the old flying boats. He was very proud of that and even showed me his ticket, which he kept, one day when we were having our weekly Friday night get together in his genkan at his house in Yonabaru. Second, the story about his earning the Navy Cross, I heard was that it was a sniper that shot him in the femur shattering it. When Dr. Warner had me read his citation in his office he told me not to believe it. When I asked him what really happened he said someone made a mistake and that was all anyone needed to know. He would not explain any further. I hope these small points help out with anyone interested in Dr. Warner. I haven’t visited this post in a while and am just seeing a lot of these comments for the first time. Thank you all for sharing, and a big thanks to Dr Warner’s family too for commenting. Also thank you Ken for the corrections. Information on Dr. Warner’s life is scarce (or at least it was when I wrote this) and I found many contradictions in different articles and interviews I used during my research. I am sure there are probably many more in here and I apologize for them. This is the best I could do with the resources I had. I welcome corrections from anyone who has any accurate information. Dr Warner was a part time Teacher of History for the University of Maryland at the same time he was Education Advisor to the USCAR Commisioner of Okinawa. I took two classes from him as part of my 2nd Bachlors degree there and he later wrote me a glowing letter for admission th a Masters Program at Chapman University. I was then a TSgt in the USAF. He was one of the best and Inspiring Teachers I ever had. Thanks for the personal story Trevis, very interesting!!! Gordon Warner was one of the finest persons I have had the honor of knowing. We were counterparts in the United States Civil Administration of the Ryhukyus (USCAR) in the late sixties; he as Director of the Education Department and I as Director of the Labor Department. We both worked late and often managed to talk into the night. Gordon was extremely modest, in fine physical condition, optimistic, and a pleasure to know. We shared many thoughts on world events and Gordon would sometime even speak of his experiences with many Japanese friends, before and after WWII. After reversion of the islands to Japan, I was heading the Overseas Veterans Counseling Program (OVCP) and wanted to hire Gordon as Regional Coordinator for Asia, as he would have been the perfect fit for that task. Sadly, the enity with the OVCP funds had another person that I had to appoint to the position. That person was no Gordon Warner and failed to complete his tour but by the time he departed, Gordon was Historian for the US ARMYRYUKUS, had married and lived with his Japanese wife in Yonoburu. His loss is not simply a loss to a fine family and his devotion to the martial arts. His loss is far greater and encompasses many of the human values tbat we all should prize and honor. Many thanks for the extra background information! I wish I would have had the chance to meet him. Thanks for the message George. Its clear to see that Gordon was a well liked gentleman. I wish I had met him once. As a young U.S. Marine I was stationed in Okinawa from late 1983 to early 1987. I had the pleasure of taking an Okinawan history class with Dr. Warner. A truly fascinating man that has been an inspiration ever since. The world could sure use more men like him. Quite belated, but my condolences to all who knew him. Thanks for the comment Ken ! While in the Navy stationed at NSGA Hanza from 81-85, had the pleasure of taking a couple of classes with Dr. Warner. The swordsmanship class was especially nice since he achieved the highest Kendo ranking(7 dan) for an American at that time. In his early 70s at the time, he was still as strong as an ox. Thanks Larry… every personal experience and anecdote added here makes the whole piece more valuable as a testament. I am so excited to see so many fine responses about Gordon sensei! What an incredible fellow he was. I had the pleasure of training in Omori-ryu Iaido under him on Okinawa and then we both attended Mu-Gai ryu as students together under the late Motoyama Shodo sensei at the Kannon-ji temple. I had the great honor of taking the shodan test alongside Gordon sensei while he tested for roku-dan. 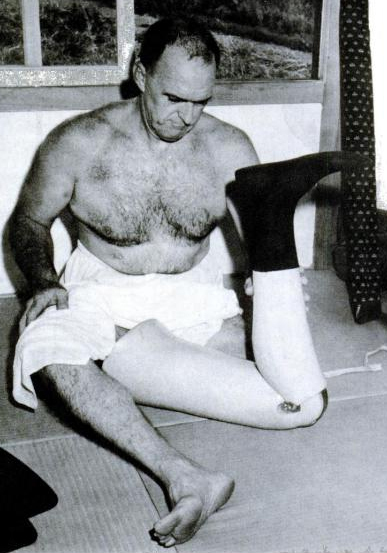 Interestingly at the time, the AJKF would not allow Dr. Warner to test for roku-dan because he could not perform any suwariwaza (obviously impossible with his ancient, very low-tech prosthesis), whereas the All Japan Iaido Federation which sponsored Mu-Gai ryu at the time, allowed him to substitute tachi-waza kata for suwariwaza. The Iaido Federation flew Hanshi Nakatani sensei, a kyu-dan, from the mainland to administer the test. So there you have it. Gordon sensei switched federations and made roku-dan on the same day. Let me say that his zanshin and sen was awesome. Facing him in bogu gave you goosebumps. It is great to see Ken Pitchford posting here too. As I recall he tested with us on that day. a couple interesting points of the many that Gordon sensei mentioned to me – I think I have them correctly: he received his Kendo shodan certificate from the hand of Admiral Yamamoto, and more amazingly, he thought that it was possible that Emperor Hirohito was observing the tests. They momentarily halted the testing on the floor and there was movement in the emperors box (which was screened) as a dignitary was received (who else would have been allowed there?). Then the testing was allowed to continue. His picture hangs above our dojo today as our honorary Soke’. Thanks for the additional information !! The plot thickens ! Gordon Warner was one of the most extraordinary individuals I have ever met. I was stationed on Okinawa from 1982-1992. He was a professor in a couple of classes I took from the University of Maryland. We had many long conversations. He would always share martial technique with me. He deeply effected my understanding of Japanese martial arts. My area of expertise is in Okinawan karate, but Dr. Warner would always give me encouragement, and very appreciated insight into my training. I miss him very much, he is very much alive in my memories, and hopefully my martial spirit. This is for Gordon Warner’s family, especially Jenny Warner-Gray. I hope this reaches you. If anyone else reads this and knows how I can reach her, please let me know. Gordon Warner was a student of my father’s at USC, and they became friends. They both were outgoing and had a great sense of humor. When Gordon returned from Hawaii , he spent quite a bit of time at our house. At the time, I was just starting high school and was a swimmer. Gordon took me under his wig and coached me. When on leave, he took me to a firing range to instruct me how to fire his 45. After Bougainville, he did visit us again, and as I recall, spent some time coaching the USC swimming team. My father died during the war, and we lost track of Gordon. As we go through life, if we are fortunate, we are awarded the honor of meeting someone who has great influence on our life. Gordon was a inspiration to me. He was larger than life, a true gentleman, a commanding presence, a good man with great heart. It has been some 70 years since I last saw Gordon Warner, but he is still with me. His family shold know this. As a civilian on Okinawa in the sixties, I took two education classes (UMUC) that Dr. Warner taught. He was a fine teacher and a giant of a man in all respects. Once at the Sanno in Tokyo, I came across him sitting in a hallway with a box of assorted old books (in Japanese) that he had just lugged back to the hotel. Though absorbed in reading his treasures, he paused and we had a good (at least for me) conversation. I notice that some mention has been made of Dr. Warner’s interest in competitive swimming. He once showed me the Olympic medal he was awarded as a member of the U.S. water polo team. To repeat: A giant of a man in all respects. February 3, 2015 at 11:24 pm) appears to have trained with him at his dojo. Is there any way that I can get in touch with this gentleman? I’m sure the gentleman above will get in touch with you when he sees this comment. I recieved a swift and very kind reply! I am doing some research into Mugai ryu and am wondering if anyone knows which branch or what the lineage is of Motoyama Shodo Sensei. I’ve trained under Hamamoto Sensei and am very interested to look at his lineage (and that of his teachers). You can see Gordon’s original commendation when he received the Navy Cross at Hall of Valor, Military Times. It fills in some of the details. I was a young NCIS Special Agent when I had the honor of meeting Dr Warner as a student in one of his USC classes. I was a Marine Officer who served in Vietnam so we quickly bonded and became friends. I mentioned to him that I would be attending the prefectural Police Judo/Kendo championships and he asked if he could go. I was able to get him an invitation and then he asked if he could do an iedo demonstration. I felt uneasy asking this favor of my local police chief, but a few bottles of Johnny Walker sealed the deal. Dr Warner did his demonstration and at the conclusion I looked around and all of the older Japanese chiefs and superintendents were crying. After that day I could do no wrong with the Japanese police. Since Dr Warner was alone in Misawa, we had him to our home to eat on several occasions including one memorable Thanksgiving where he ate more than was humanly possible. The man had an appetite. I still have an autographed copy of his Okinawa book. When did he teach at USC? I assume that was the University of Southern California. He was a student there in the 1930s. I have numerous letters from Dr. Warner who was a friend of my mother’s. She met him at Long Beach State College when she was studying for her Bachelors Degree. Have not read all of them but after reading about Dr. Warner and all his accomplishments I will read them before discarding them to see if there is more information pertinent to the notes on this sight. My sister and I met Dr. Warner who had become a family friend during the late 1960’s.